For Valentine's Day I wanted to make the stone statues that were made popular by the Edinburgh Casting Studio in the UK, pictured above. 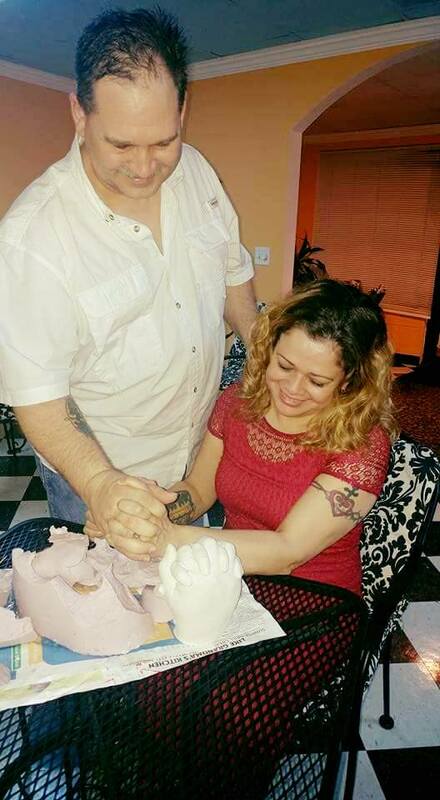 The company circulated a video on Facebook(R) that had everyone sold on making a handhold statue with their significant other. (You can look at the video here). Because I am a crafty person, I decided I could do this myself, rather than try to figure out how to buy from England and how to pay shipping and all that! Once figured out, I offered it as one of my DIY classes. These are some of the tips, along with pictures of our Valentine Craft Night. 3. Bucket large enough to fit holding hands with about 1/2 inch around hand. 1. Have a blender ready with one beater, plugged in, with the bucket next to the alginate compound with a cup ready to measure. 2. Have the couple go to the bathroom, take off any watches or bracelets and put baby oil on the hand they are going to mold and over their wedding rings (if desired). It helps to have the couple practice how they are doing to put their hands in before you start the next step. 3. Measure 8 cups of water and make sure the water temperature is no more than 80 degrees F.
4. Pour into your bucket and start mixing with one cup of alginate compound at a time, until all 8 cups have been mixed in. 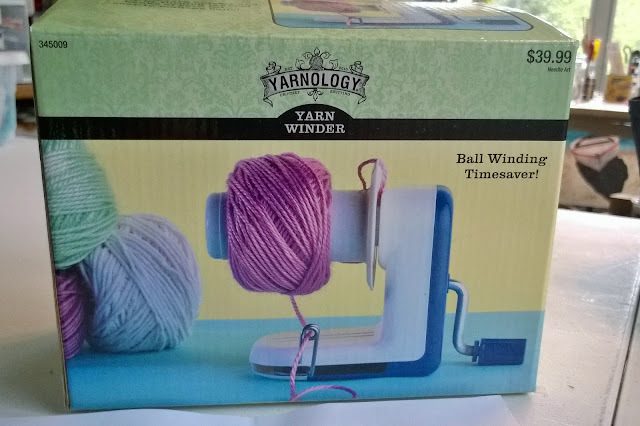 (Work quickly, it has a 10 min setting time, and if your temperature was off by any amount, the setting time will vary). The mix does not have to be perfectly mixed, just the best you can, this isn't cake! 5. Quickly tap your bucket on the table to release air bubbles trapped in the alginate compound. 6. Have the couple put their hands in the compound immediately, set the timer for 10 minutes. 7. Test the alginate to see if it set, but poking the surface, it should be like a hard jello. 8. Remove hands from the alginate compound, one person at a time. 9. Mix the stone powder using disposable cup, bowl and mixing spoon. 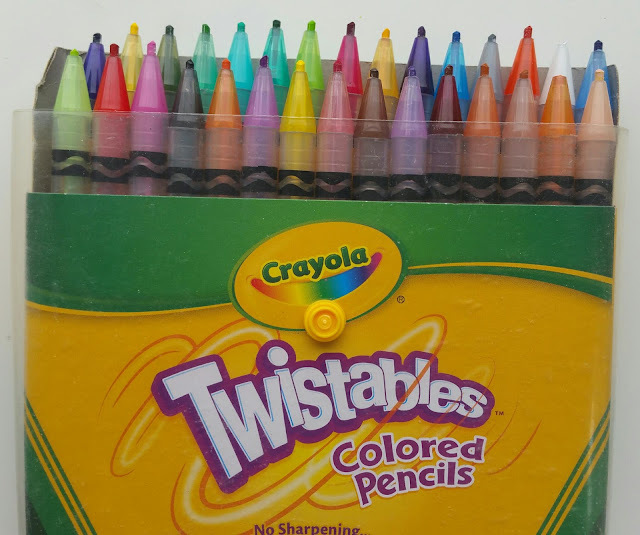 This stuff is toxic, so don't breathe! For every one cup of water you need three cups of powder. 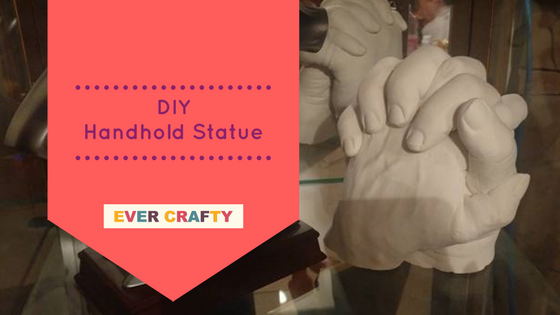 It takes about one pound of stone powder per hand, so you need almost the whole two pound bag for a handhold statue. 10. After it is mixed fairly well, pour into the bucket with the alginate mold, until it reaches the top, but not overflowing (unless you want a base for your handhold statue, but keep in mind that you will need more mix). 11. Tap lightly to release air bubbles and leave in a flat surface to cure for 30 minutes. 12. After 30 minutes check your stone, if it still feels wet, leave for an additional 15 minutes. 14. The FUN part! Start digging away at the alginate, to reveal your stone statue. 15. Trim away any stone bubbles using your clay tools or knife, being careful to hold your statue and that you don't drop it. DONE! -When mixing alginate, a blender speeds up the setting process (the science behind this is, motion creates heat, heat makes the alginate set quicker). Make sure the person is ready, standing by for when you are done mixing, if you use a blender. Also, use the slowest possible setting on your blender! -Using one blender blade, instead of both helps the alginate not set as fast, less motion. -Baby oil helps get the alginate not to stick to your rings. 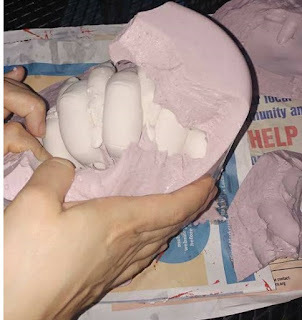 -Before inserting your hands into the mold, tap the alginate so the air bubbles will come out. 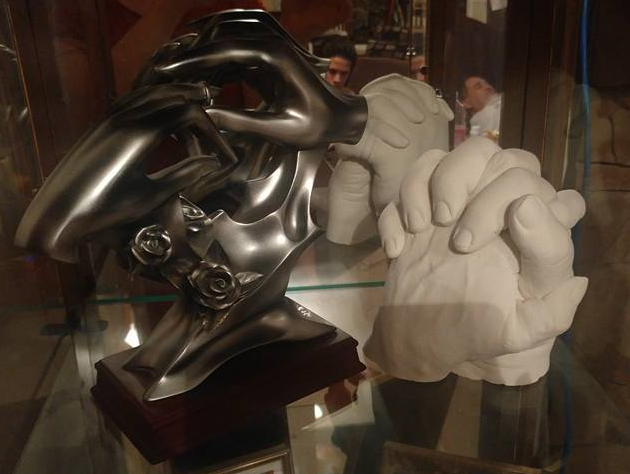 If not your final product will produce a hand with "warts" on it (little air bubbles made of stone). If this happens, you can shave then of, using pottery tools, an exacto knife, or a regular knife. Just do it carefully so that you don't make a visible dent in your statue. -Think about the position of your hand statue. If you want it to stand up straight, you have to put your hand in such a way that it will stand. A hand that is bent more in one direction will not stand because of the weight (gravity). -For the bucket, I went to my local Dollar Store and bought a small oval trash can. Have you made a statue using these materials? Let me know your tips and tricks below! Did you try this DIY? I would love to see your statue. Until next time crafty friends!